The cucumber, a regular visitor in your side salad, is actually considered a fruit. But whether you call cucumbers fruits or veggies, is beside the point. They are packed with a ton of nutrients, so it is well worth our while to make the effort to include them in our diet. And there are many ways to eat these delicious, nutrient-packed green gems other than slicing them over a salad. Cucumbers make great chip alternatives. Use them as a vehicle to eat guacamole, hummus and other healthy dips. Add sliced cucumber to water for some “spa water.” You can pickle them for a tangy, refreshing side dish. And if you really like to get creative in the kitchen, check out this cucumber soup recipe. I personally enjoy cucumbers simply sliced with a little bit of sea salt and black pepper. This is the perfect snack when I am craving something crunchy and salty, like potato chips or pretzels. Whatever your preference, here are some reasons why adding cucumbers to your life is a smart choice. Cucumbers may help protect your brain & fight several types of cancer. Cucumbers contain an antioxidant called fisetin. “Several studies have demonstrated the effects of fisetin against numerous diseases. It is reported to have neurotrophic, anti-carcinogenic, anti-inflammatory, and other health beneficial effects,” according to the National Institutes for Health (NIH). Fisetin may also help prevent brain tissue inflammation and damage. This may lower your risk for Alzheimer’s. If you are diabetic, you may want to eat more cucumbers. Fiber is important for diabetics, because fiber helps lower blood sugar. 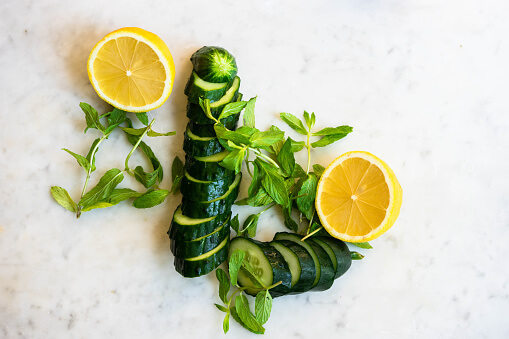 Not only are cucumbers a great source of fiber, but they are fruits with a very low sugar content. Cucumbers are rich in an essential mineral, you likely never even heard of. Cucumbers are a good source of the mineral molybdenum. Molybdenum’s actions are mainly in the production of enzymes, proteins that trigger chemical reactions in the body. These enzymes are involved in uric acid formation, transportation of iron, carbohydrate metabolism and sulfite detoxification. In China, living in areas with poor molybdenum concentration has been linked to esophageal cancer. Need to freshen your breath? Try a cucumber. If you are out of mints or gum, take a cucumber slice and press it to the roof of your tongue for about 30 seconds. The phytochemicals (chemicals made by plants) in cucumbers help kill odor-causing bacteria in the mouth that may cause bad breath. An added bonus is you will avoid the refined sugar in many mints and unnatural materials in many sugar-free gums. Having trouble staying hydrated? Eat cucumbers. It’s important to drink water throughout the day to stay hydrated. And water has so many purposes in the human body including transporting nutrients, aiding digestion and flushing toxins from the liver and kidneys (which helps these organs function properly). But let’s face it, sometimes it’s hard to be diligent about drinking water all day. If you need some help staying hydrated, eat sliced cucumbers as a mid morning or late afternoon snack. Cucumbers are about 95% water. Water also helps prevent hunger pangs, headaches and may even keep your energy levels up. Cucumbers may even help relieve a hangover! Have a sunburn? Try some cucumbers. Aloe vera is not the only plant you can use to treat sunburns. If you have a sunburn, apply some sliced or mashed up cucumber to the affected area. The anti-inflammatory compounds found in cucumbers may help soothe inflammation caused by your sunburn. Eyes a bit puffy due to lack of sleep or maybe after a long flight? Try some sliced cucumber. Cucumbers contain ascorbic acid (vitamin C) and caffeic acid, which helps soothe skin irritations and swelling. The skin around your eyes is very sensitive. Give it a little TLC with some sliced cucumbers. This may even help get rid of dark circles. And cucumbers are packed with a variety of vitamins and minerals. Calcium, 48 mg. An adult between 19-50 years of age (male or female) in general should aim to have about 1,000 mg. of calcium per day. This mineral is needed to build and maintain strong bones and teeth. Calcium is also needed for clotting of the blood to stop bleeding and for proper functioning of the nerves, muscles and heart. The National Cancer Institute conducted a study that monitored calcium intake in 135,000 men and women. The subjects who had a calcium intake of more than 700 mg. per day had a 35-45% reduced risk of cancer of the distal (lower) part of the colon than those who had a calcium intake of 500 mg. or less per day. Magnesium, 39 mg. This must-have mineral helps with blood pressure regulation and also has antioxidant properties. Several studies have also shown an improvement in the severity of symptoms of depression when study participants were given 125-300 mg of magnesium with each meal and at bedtime. Phosphorus, 72 mg. This mineral often does not get the credit it deserves, but it does so much for your body. Phosphorus is almost as abundant in your body as calcium and helps calcium build strong bones and teeth. Phosphorus is also important for how your body stores and uses energy, repairs cells and is needed to make proteins like the one responsible for the oxygen-carrying capabilities of our red blood cells. This mineral has also been linked to weight management. In a study of almost 40,000 women in Korea, phosphorus deficiency correlated with weight gain from oral contraceptives. Furthermore, a study from Lebanon showed that phosphorus supplements in a small group (63 people) for 12 weeks significantly decreased body weight, BMI, waist circumference and subjective appetite scores. Vitamin K, 49.4 mcg. This vitamin is very important, as it helps regulate normal blood clotting. It also helps to transport calcium throughout the body, so it is very important for bone health. They say you are what you eat, and in this case it feels good to be ‘cool’ as a cucumber.